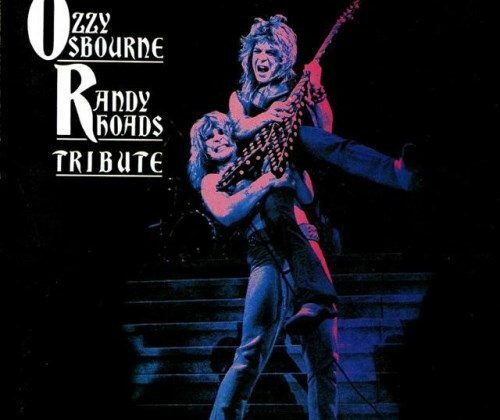 Home›Features›Ozzy Osbourne and Randy Rhoads - A Look Back at the Tribute Live Album! By 1981, Ozzy Osbourne’s career was back in full swing. Anyone who thought he was down for the count with his firing from Black Sabbath was quickly proven wrong with the arrival of his first post-Black Sabbath album, Blizzard of Ozz, and by the subsequent live shows. Former Quiet Riot guitarist Randy Rhoads had become the person Osbourne so heavily needed to give his songs that extra edge and help his post-Sabbath work to stand out from the crowd. The initial lineup of Osbourne’s post-Sabbath band was rounded out by a rhythm section of former Rainbow bassist Bob Daisley and former Uriah Heep drummer Lee Kerslake. These two participated on the recordings of Osbourne’s first two post-Sabbath records, but following the sessions for said albums, were let go and replaced by the rhythm section of bassist Rudy Sarzo (who has played with countless classic hard rock bands, most notably Quiet Riot) and drummer Tommy Aldridge (the Sarzo/Aldridge rhythm section would later reunite in MARS and Whitesnake). Tribute was Ozzy Osbourne’s first recorded live album in his solo career, with the majority of the material on the double album being taken from a concert in May 1981 during an American tour. The guitar solo was recorded later in the year and inserted into an older track, while the two tracks at the end of the release (prior to the “Dee” outtakes) were recorded in late 1980 on an early tour, still featuring Daisley and Kerslake. Due to Rhoads’ unexpected death in a plane crash in March of 1982, the album was shelved and another live album, Speak of the Devil, was recorded and released in its place. Thus Tribute is the first recorded Osbourne solo live album, but the second released. 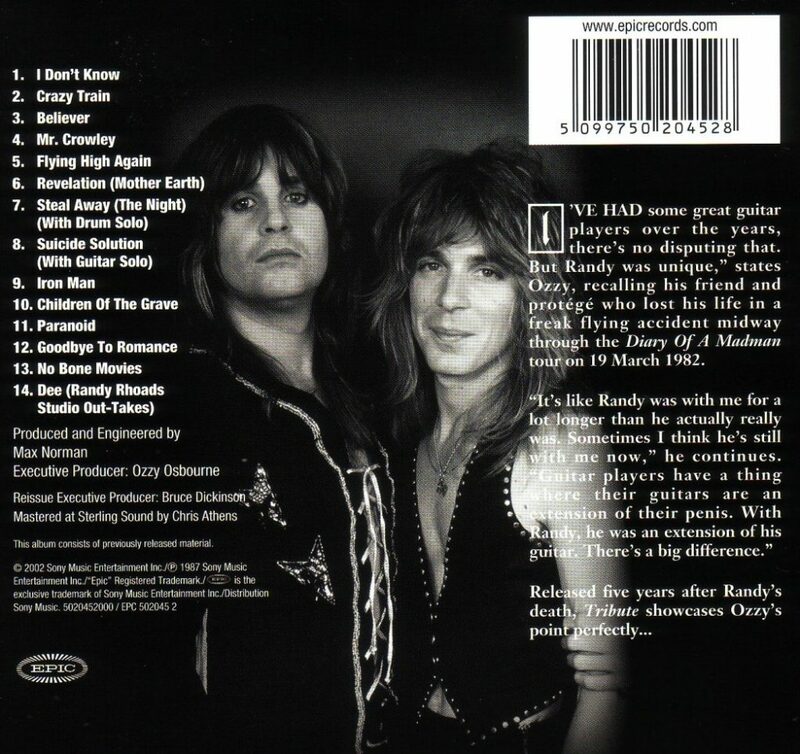 Ozzy Osbourne's first recorded live album was Tribute, largely meant as a tribute to the late Randy Rhoads. This is the rear cover of the 2002 CD remastered version. The setlist for this live album is comprised mostly of songs from the Blizzard of Ozz studio album, with a handful of cuts from Diary of a Madman (which had been recorded but not yet released at the time these live cuts were performed) and some from Osbourne’s old Black Sabbath days. As the album was somewhat rebranded to be a “Tribute” to the late Randy Rhoads, some outtakes of him attempting to record “Dee” in the studio are included as something of a bonus. It would have been nice to have gotten some more of the Diary of a Madman songs and a few obscure Black Sabbath songs, but it is unlikely any fan will be disappointed with the selection of songs that they get here. Randy Rhoads hated performing the old Black Sabbath songs live during these tours, but did so as it was part of the job. As such, these songs feel a little out of place compared to the Osbourne solo songs, which are largely defined by Rhoads’ distinctive playing style. That is not to say these are bad renditions of them by any means, though. Tribute has been released on CD three times to date. Once during the original boom of old albums being ported over to CD, once in a remastered form in 1995 (this version omitted the operatic intro to the show before “I Don’t Know) and in a newly remastered form in 2002. The latter is the version that fans should have. Tribute is live Ozzy Osbourne at his absolute finest, in his post-Sabbath prime. It is the definitive live Osbourne record; dominated by the playing of the legendary Randy Rhoads a year prior to this unfortunate death. 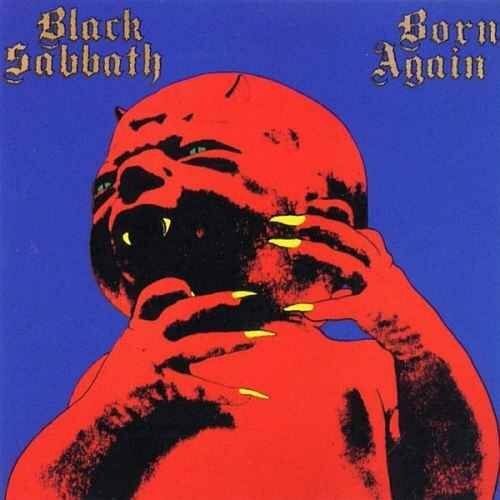 No one who is a fan of this classic era of heavy metal greatness will be disappointed in what they hear here. Absolute highest recommendations; this one belongs in your collection.